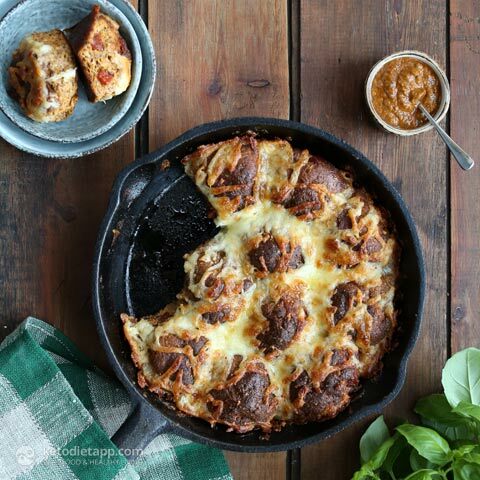 This easy to prepare pull-apart pizza bread makes a great keto appetiser or side dish. I used chorizo and grated mozzarella but you can add bacon, grated cheddar or Swiss cheese, olives or even sun dried tomatoes. Your imagination is the only limit to what you can come up with! 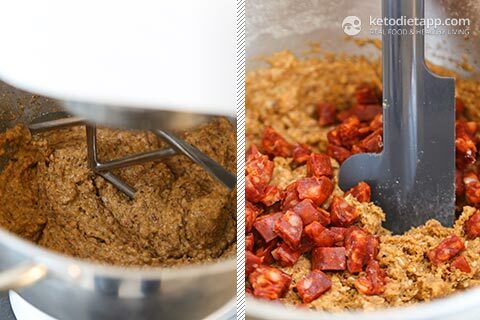 If you can eat nuts but are dairy-free, try my Ultimate Keto Bun recipe for the bread base, and add your favourite toppings. Note: Instead of 1 tsp cream of tartar + 1/2 tsp baking soda, you can use 2 tsp of gluten-free baking powder. Make sure you weigh all the dry ingredients using a kitchen scale. Even small differences can affect the final result of this recipe, especially in case of psyllium and flax meal! Prepare the marinara sauce by following this recipe. 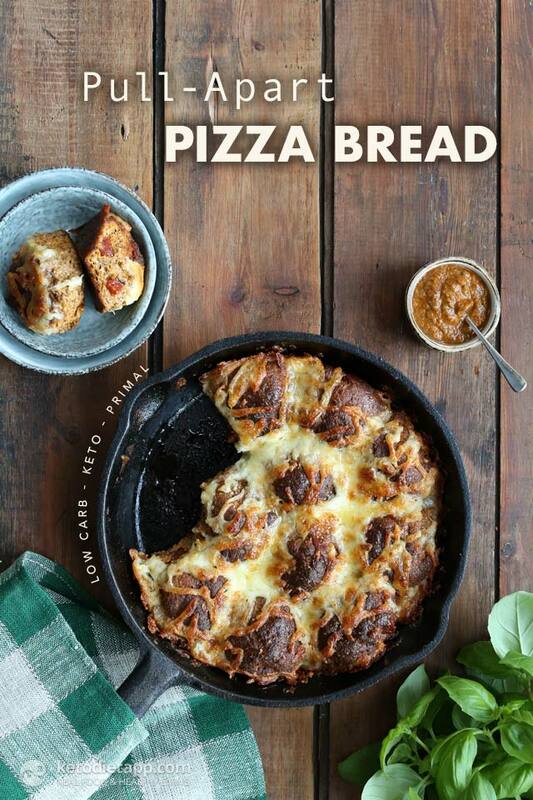 You will need 1/2 cup for the bread (any leftover marinara can be used as a dip or stored in the fridge for up to 2 weeks). Preheat the oven to 175 °C/ 350 °F. In a bowl, mix 1/2 cup of marinara sauce, egg whites and water. Dice the chorizo into small pieces (up to 1 cm/ 1/2-inch each) and set aside. 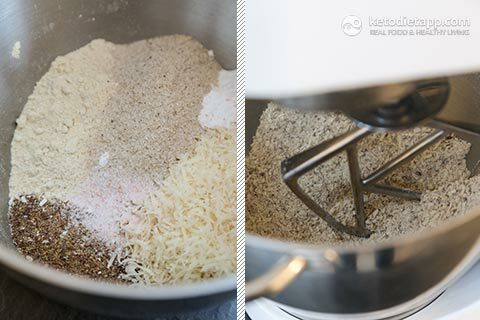 In a bowl or a mixer, combine all the dry ingredients: sesame flour, flax meal, parmesan cheese, psyllium powder, cream of tartar, baking soda and salt. 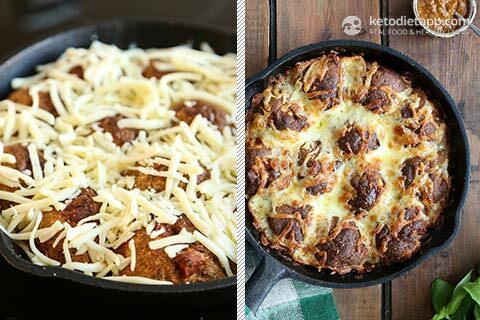 Grease a medium cast iron skillet (25 cm/ 10-inch) and heat over a medium heat. 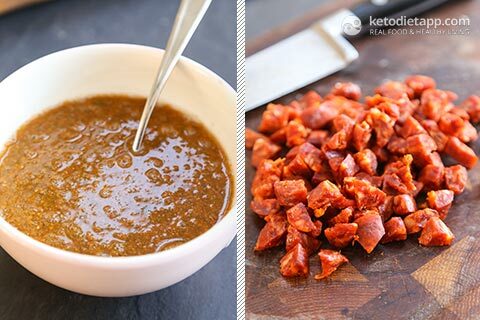 Pour the marinara mixture into the bowl, process for a few seconds, and then add the diced chorizo. Using your hands, make round 12 buns (about 60 g/ 2 oz each), and place in the preheated skillet. Transfer into the oven and bake for 25-30 minutes. Top with grated mozzarella cheese and return to the oven for another 5 minutes, or until the cheese is melted and crisped up. When done, remove from the oven and let the bread cool down for 5 minutes. Optionally, serve with the remaining marinara sauce. To prevent the bread from getting moist, don&apos;t leave it in the skillet. Instead, place on a cooling rack. To store, let it cool down and refrigerate for up to 3 days, or freeze for up to 6 months. I have the same problem sourcing sesame flour. 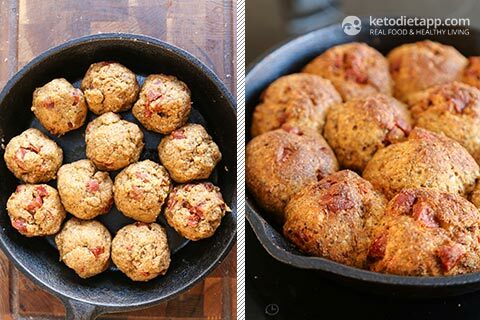 Would substituting with almond flour affect the rresults greatly? Thanks for all you excellent recipes! Hi Nat, sesame flour is more absorbent which means that if you use almond flour (fatty and less absorbent), you will have to reduce the amount of liquids. I haven't substituted sesame flour with almond flour in this recipe but I would use just 1/4 cup of water (or maybe even less). Or you can try whole sesame seeds and grind them just like you would flax seeds to make flax meal. I see you use flax in some of your recipes. There were some studies that suggested that flax should be avoided due to its phytoestrogen content. "The latest research shows that consuming flaxseed does not increase risk for breast cancer. At one time, there was concern that flaxseed’s lignans, classified as phytoestrogens could raise the risk of breast cancers that are fueled by high levels of estrogen. Now studies show that although lignans’ chemical structure is like estrogen, they don’t act like estrogen in the body. In fact, research indicates flaxseed may be protective, especially in post-menopausal women. It seems to decrease cell growth, increase self-destruction of abnormal cells and shift estrogen metabolism to less cancer-promoting forms." Looks amazing! Is there an alternative for the flax? Or if you simply want to substitute flax seeds in this recipe, you can try more sesame flour (I'd use 1/3 cup) - this is just a guess but should work fine. I live in Canada and sesame seed flour is not easily available and I wondered if you have tried an alternate flour in this recipe? This looks delicious! Is there a substitute I can use in place of sesame seed flour(I not able to eat sesame)? Hi Candyce, see my comment above - I hope this helps!